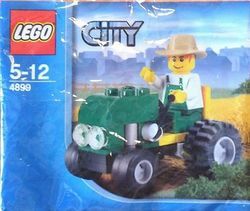 4899 Mini Tractor is a Farm set released in 2009. It was a free promotional set released in 2009. It came in a Polybag. It also came with the Daily Mirror / Sunday Mirror Promotions. In LEGO Stores in the US in June 2010 it came free with a $50 purchase. A Scan of the LEGO Magazine Entry. Facts about "4899 Mini Tractor"
This page was last edited on 9 February 2019, at 19:05.